General Electric (GE) Global Research will design, manufacture, and test an absorption heat pump that can be used for supplemental dry cooling at thermoelectric power plants. 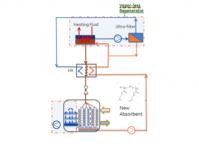 The team's project features a novel, absorbent-enabled regenerator that doubles the coefficient of performance of conventional absorption heat pumps. The new absorbents demonstrate greater hygroscopic potential, or the ability to prevent evaporation. To remove heat and cool condenser water, these absorbents take in water vapor (refrigerant) and release the water as liquid during desorption without vaporization or boiling. GE's technology will use waste heat from the power plant's flue gas to drive the cooling system, eliminating the need for an additional power source. GE estimates the system will cost half that of conventional absorption heat pumps. If successful, GE will develop an improved absorption heat pump that significantly increases the effectiveness of absorption heat pumps, but at a much lower cost. The team's system results in negligible net water use, and therefore can eliminate the need for local water resources for cooling and help conserve water for other uses. GE estimates that the cost of its system will be 50% less than conventional absorption heat pumps on the market today, which could accelerate the adoption of dry-cooling technologies.